Thursday Evenings in October and November, 7:00 – 8:30 P.M. Participants are responsible for acquiring suggested texts as background reading, if they wish to have them. Otherwise we will prepare handouts for each session. Get yourself a teacher, find someone to study with, and judge everyone favorably. 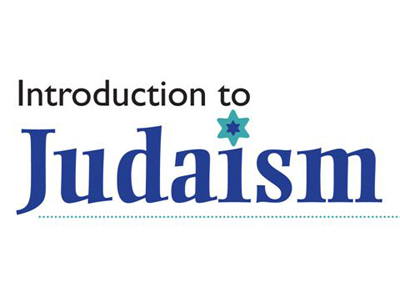 FJC is pleased to announce the return of our adult Lifelong Learning course An Introduction to Judaism, taught this fall by Rabbi Lieberman and Pamela Rothstein, Director of Lifelong Learning. This course is open to members and to the community-at-large, many of whom express interest in knowing more about Judaism. This seven-session course does not function on a drop-in basis for certain topics, but rather requires a commitment to attending all sessions (speak with us if you can make most but are leaving town before its final session). We wish the group to partner and coalesce as a learning community. With the help of suggested readings and handouts, participants will explore topics of Jewish life and culture such as holidays, rituals, history, core beliefs, ethics, social justice, diversity, spirituality/worship, and the role of Hebrew. Is this course for you? If you have a continued curiosity about Judaism and wish to explore it afresh with others, we respond in the affirmative. It is not designed exclusively for the beginner nor for the experienced Jewish student, but for everyone – Jewish and non-Jewish, new members and long-time members, people of all ages (post b’nei mitzvah). Rabbi Burt E. Schuman has aptly suggested that Jewish learning is like a carousel: You get on at any point and continue the ride. If you have little knowledge of Judaism, we hope that you will participate in this course and let it take you to another point of Jewish learning. If you are someone with considerable Jewish learning, but that learning is incomplete or took place long ago, we would encourage you to hop on the carousel again. Interested? Call or send in your RSVP, but first call a friend or someone you would like to get to know better and who might be interested. Jewish tradition teaches us to “go find yourself a partner” and study. If you have friends, Jewish or non-Jewish, who are not members, invite them to attend. If you have questions about whether this is right for you, please contact Pamela Rothstein or Rabbi Lieberman.